Here on turbovec rims, but i have now fitted some 15 inch rims off a S13. Will post more pics. Engine is from a Silvia Turbo S12, and has 5 speed. Beautiful mate. I hope my b210 can look half this good someday. Just checked out your site. Obviously you've put a lot into this Dat - quite an inspiration! Keep it up! silly question,but what nissan commercials were available in the uk,because from the a15 powered c120 vanette on,they all had h190's,usually with leaf springs.the later c120's with z20's had big axle h190's,which should take lots of power,but they are wider than the 120y diff.they probably didn't sell them over there,but you never know. ...and i once saw a web page that you made for this car...do you have the link for it? This car is beautiful,one of the best 120Ys I have seen. Stick with these wheels,they suit it better than the ones in the other pic. That looks really nice! I like it. Yeah, i like this style of wheel better than the ones in the other pic also. Hi guys, yes I am in England, 50KM south of London. Thanks for your comments. I have been driving the car for 4 years now, and I love it. (apart from its habit of eating diffs. ) STILL don;t know what to do about that. In answer to your questions.. the side repeaters are from a 180B 810 (came as 200B in Aus?) They are a straight bolt-in fit, (apart from the wires are too short) and are a bit neater than the originals. The car is lowered 3 inches and has 280ZX front struts with 200LB coilover springs. Antirollbar is a reshaped 22mm one from a 180B 810 mounted in Poly bushes. Seats are from Silvia (gazelle?) S12. Tail lamps are home made. Yeah this thing really has been done nice and these wheels do it much better than the others. You should add your website to your profile. This is a match for the best B210 ever! 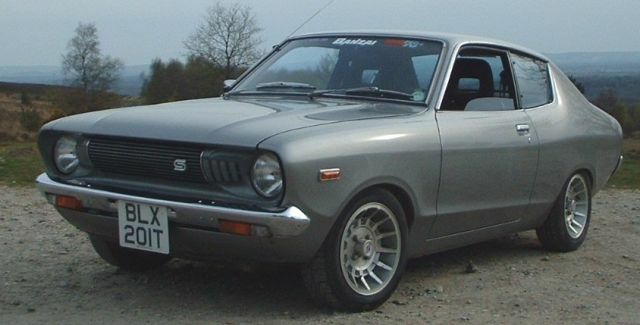 I hear that a Datsun 410/411 rear end is a bolt in, and has the heavy-duty (H190?) differential. Maybe I should read the "what diff" tech article again.